This chaise lounge could be easily used as a single bed. Add a touch of style to any room with this mission style chaise. Click here for detailed chaise lounge plans. This beautiful piece of mission furniture can be made at a very moderate cost. White oak will give the best results except for the frames or slats on which the cushions rest and these may be made of poplar or pine. 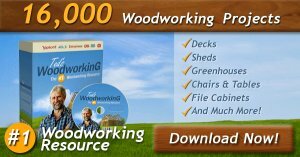 If a mill or woodworking shop of any kind is handy, the hardest part of the work can be saved by securing the following list of material, cut, planed, sanded and squared up to the exact sizes given. 2 posts, 3 in. square by 17 in. 2 posts, 3 in. square by 26 in. 2 rails, 7/8 by 8 by 82 in. 1 rail, 7/8 by 8 by 25 in. 1 end, 7/8 by 18 by 25 in. 1 piece, 7/8 by 9 by 24-1/2 in. The last piece on the list when sawed diagonal makes the two slanting pieces at the head of the couch. The corner braces are made from two pieces of straight-grained oak, 2 by 4-1/2 by 4-1/2 in., sawed on the diagonal, and cut as shown in the enlarged plan section to make the four pieces. First be sure the legs are perfectly square, the two short ones and the two long ones of equal length respectively. Either chamfer or round the upper ends as desired, chisel and plane the taper on the lower ends. Lay out and cut all the tenons on the rails—1 in. is the amount allowed at each end in the stock dimensions given. Arrange the posts and rails in the positions they are to occupy in the finished couch. Number each tenon and the place its corresponding mortise is to be cut in the post. Mark each mortise directly from the tenon which is to fit into it, taking care to have all the rails an equal distance from the floor. Bore and chisel out all mortises and see that all the rails fit perfectly, before proceeding with the work. The next step will be to fit in the slanting side pieces at the head of the couch. These must be let into the long posts 1/2 in. and held also by a dowel in the side rail. In order to get these pieces into place, the mortise in the long post must be made 1/2 in. longer than the tenon on the sloping side piece so the tenon may be first pushed into the mortise and then the side clamped down on the rail over the dowel. The whole couch should fit together perfectly before gluing any of the parts. Glue the end parts together first. Hot glue will hold best if the room and lumber are warm; if these cannot be had, use cold glue. After the ends have set for at least 24 hours, glue in place the side rails and slanting head pieces. Screw in place the corner braces. Be sure when making these braces to have the grain running diagonally across the corner, or the brace will be weak, also, be sure the sides are square with the ends; this may be determined by measuring the diagonals to find if they are equal. 2 pieces, 7/8 by 2 by 56 in. 2 pieces, 7/8 by 2 by 25 in. 4 pieces 7/8 by 2 by 21 in. This material may be of pine or poplar. These pieces are made into two frames as shown in the drawing and held together with long screws or nails. Fasten with glue and screw short blocks on the inside of the couch rails for holding the two frames in place. Tack pieces of cheap burlap across the frame and cover with ordinary black cambric. This will give a strong, springy rest for the cushions. 2 cleats, 7/8 by 2 by 56 in. 2 cleats, 7/8 by 2 by 25 in. 12 slats, 3/4 by 5 by 25 in. The materials listed may be of soft wood the same as for the frame. The cleats are fastened to the inside of the rails of the couch with screws, so the top edge will be 2 in. lower than the top edge of the rails. The slats are spaced evenly on these cleats. After the glue is all set, remove the clamps and scrape off any glue that may be on the wood. If this glue is not removed it will keep the stain from entering the wood, which will show up when finished in white spots. This couch may be stained in any of the shades of brown or dark to harmonize with its lines of construction. A water stain will penetrate the wood best and after this is applied and thoroughly dried the surface should be well sanded to remove the roughness of the raised grain. Apply one coat of thin shellac and when this is dry, put on two coats of wax. In making up the cushions, use either hair or elastic felt for the filling.